Affirmations help you stay focused on your dream goal and counteract any negative self-talk that can come up when you are faced with doing something you haven’t tried before. Dreams require that you stretch the limits of who you think you are and demand that you become more. Affirmations can support you in that journey until your outer world reflects the dream captured in your imagination. When affirmations are done with intensity and repetition, your mind will begin to treat the statement as fact. 1. Dream success and great fortune flows toward me right now in a river of superabundance. 2. I now attract success with my dream ideas. 3. Dream achievement is a natural outcome for me. 4. I am fully capable of achieving my dream. 5. Despite current appearances, my dream is coming true right now. 6. My dream of [name your dream here] is coming true right now. 7. My dream to be [name your dream here] appears in my life right now. 8. Dream opportunities naturally appear with each step that I take toward achieving my dream. 9. The positive outcome is always mine. 10. Successful dream achievement is my natural state of mind. 11. My dream salary of [name amount] is here right now. 12. Today is the day that I make my dream come true. 13. 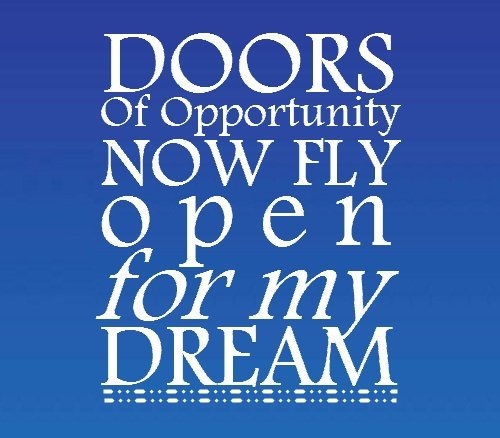 Doors of opportunity now fly open for my dream. 14. I am a living example of dream achievement. 16. I am not too old to set a new goal or dream a new dream. 17. There is always something to be grateful for on this dream journey. 18. I am open and receptive to everything that happens to me on my dream journey. 19. I now have the power to achieve my dreams today. 20. I am a [insert dream name], richly paid for my creations. 21. I give thanks for the satisfying fulfillment of my dream. 22. My life is glowing with radiant beauty, radiant wealth, and radiant good. 23. I refuse to give up on my dream. 24. It is my divine destiny to achieve [name your dream]. 25. 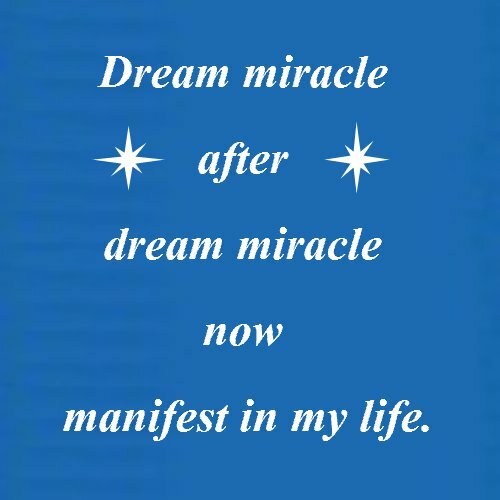 Dream miracle after dream miracle now manifest in my life. 26. My dream plan is now moving quickly towards fulfillment. 27. All financial doors are open, [dollar amount] now flies to me without delay. 28. I am rich in dream abundance. 29. Every day in every way, my dream is coming true. 30. I have all that I need for dream achievement. 31. My dream possibilities are endless. 32. I now receive dream guidance from expected and unexpected sources. 33. I have all the time I need to achieve my dream. 34. It is easy for me to complete my dream goals. 35. Every day in every way my dream life gets better and better. 36. I accept that fear means I am on the right track towards an amazing life. 37. Today I face my fear and take a risk to make my dream come true. 38. Today I seize every dream opportunity that comes my way. 39. Setbacks are simply soft stepping stones on the path to achieve my greatest dream. 40. Every positive effort I put out there to achieve my dream will be equally rewarded now. 41. I enjoy dream achievement everyday. 42. I am comfortable moving forward on my big dream. 43. 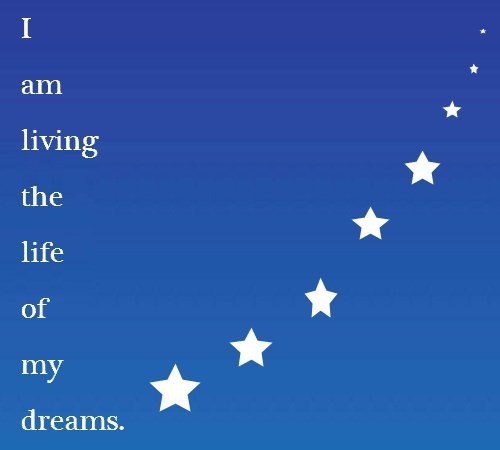 I am committed to achieving my dream of [name your dream]. 44. Nothing will stop me from achieving my dream. 45. I am living the life of my dreams. 46. Money is flowing into my dream of [name your dream] now. 47. I have all the energy I need to achieve my dream. 48. I am surrounded by love and support for my dream. Remember to write down or say your dream affirmation 40 times a day for a minimum of 40 days. It takes 40 days to impress a new idea upon the unconscious mind. You want to find yourself naturally repeating the affirmation until the situation is the reality that you desire. Some people write their affirmation on their bathroom mirror, others on an index card so that they can keep the affirmation with them. You can create a song out of the affirmation and sing it when driving. You can say it every time you are stuck in traffic or at a stop sign. You could print it out in large font and tape it to your ceiling so that you say it just as you are going to sleep and when you wake up in the morning. The important thing is that you create a way to remember to confirm to your mind the positive outcome you expect to see in your dream life. Affirmations are very powerful and are an important component to staying on track with your dream. You really can make your dreams come true. 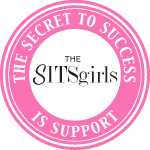 Article Source: The 48 Best Success Affirmations for Dream Success by 8 Women Dream.